There are no additional services and we rent everything you need, so please don't bother to bring anything with you. ※ Yukata (summer kimonos) are provided during the summer. ※ We do not provide makeup services in any of our packages. 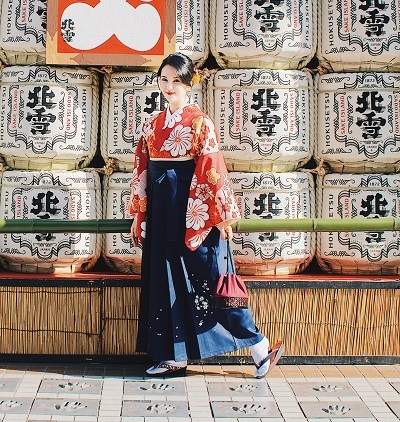 Kimono/Yukata rental + Hair-Styling + Accessories/Ornaments are included. Price stated is a per person rate, in a group of three people or above. Group package services are the same as regular packages. This package is for children under 10 years old and under 140cm in height. Furisode rental + Hair-Styling + Accessories/Ornaments are included. Homongi rental + Hair-Styling + Accessories/Ornaments are included. Hakama & Kimono rental + Hair-Styling + Accessories/Ornaments are included. This is an overnight charge for customers who wish extend their rental period until the following day.